Once every year or two, I make a big batch of homemade tamales. For the last several years, some of my friends have wanted to learn how, but we just haven’t been able to coordinate a time to do it until recently. A couple weekends ago, we all took off to one friend’s log house in the woods for a weekend of cooking and sewing. We made close to 150 tamales (I rendered the lard beforehand), some easy (and amazingly delicious) non-refried refried beans, a little Mexican rice and blackberry mojitos. And in between it all, we finished a few sewing projects on the side. 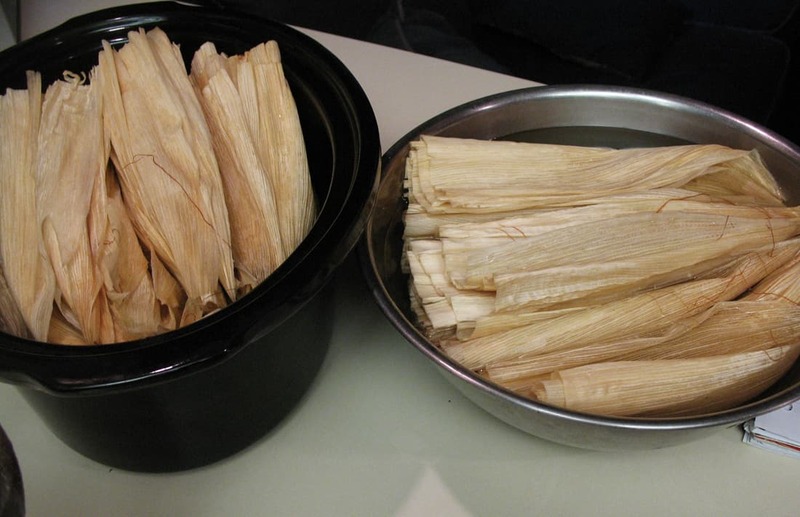 If you’ve never made tamales, but have wanted to try, don’t let the directions intimidate you. They aren’t hard to make, but there are several steps involved. I personally like to make tamales in two days, preparing the meat filling the day before. It helps speed the tamale-making process along a bit when you don’t have to wait for the meat to cook endlessly before you assemble them. This time around we made both meat (pork) and vegetarian (a mix of veggies from the garden). If you’re going to go to the trouble of making tamales, I say go big. It’s not that much more work to double (or more!) a batch, and they freeze up really well. 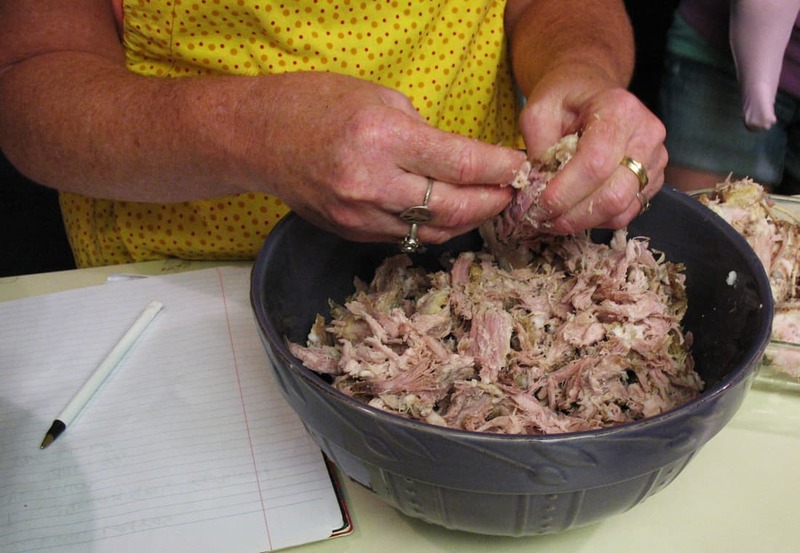 Cook meat until tender (I throw it in the crock pot and cook it all day the day before I make the tamales). Grind or shred cooked meat. Brown in hot oil. Sprinkle with flour while stirring. Add 1.5 cups of water and bouillon. Stir. 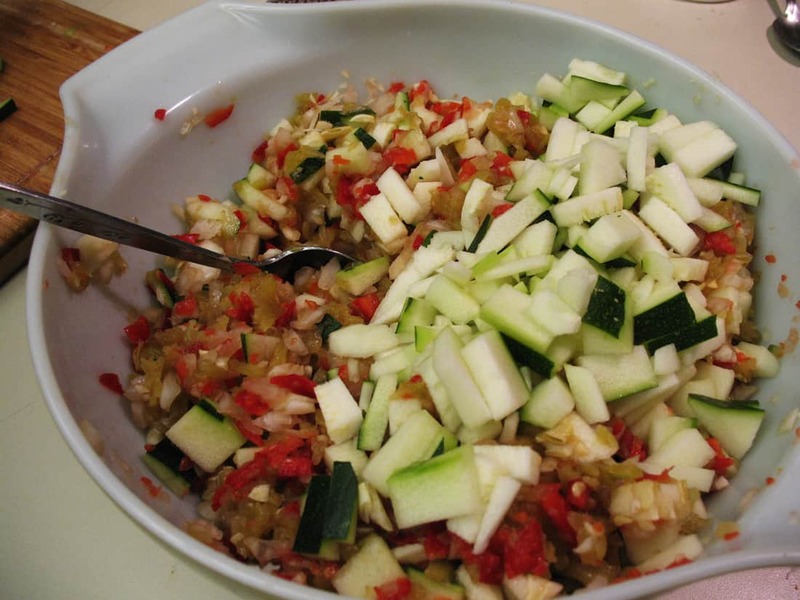 Add the remaining ingredients, cover and simmer for 45 minutes. Beat lard and salt until fluffy. Mix in masa and water. Beat well. Assembly line style tamale making. The rolling part is a bit awkward at first, but if you make the masa square wide enough and don’t over-do it with the filling, it all comes together. The goal is to have the masa completely surrounding the filling as you wrap it all up together. 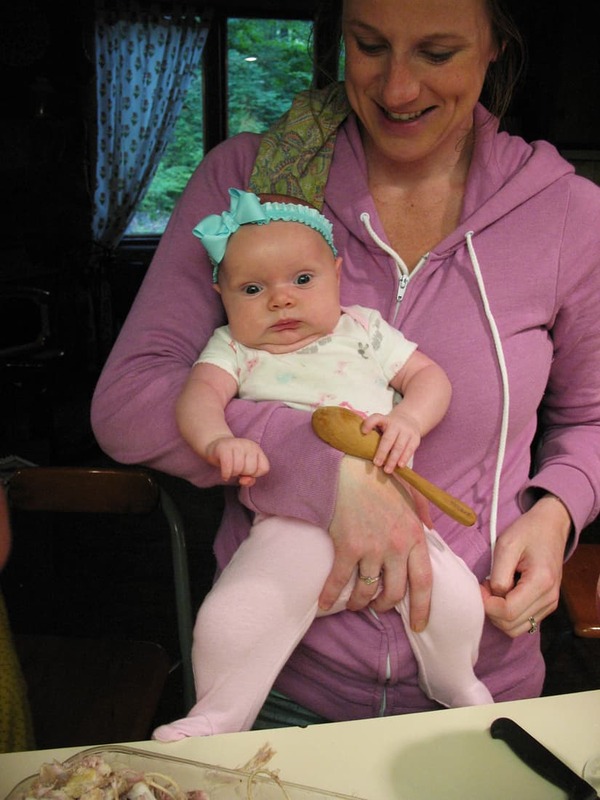 You’re never too young for your first cooking lesson! 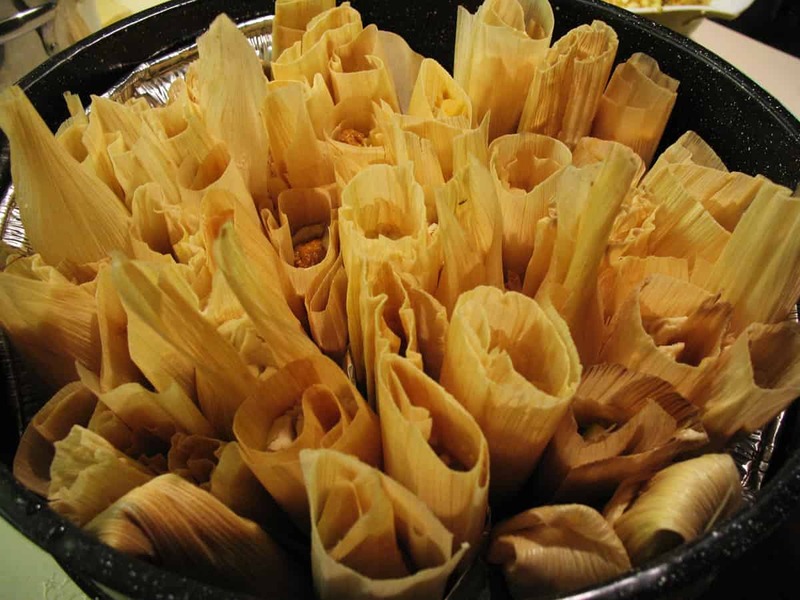 Steamed tamales, ready to unwrap and devour. Once they’re wrapped, place them upright in a steamer**, cover and steam over medium heat for 2 hours. 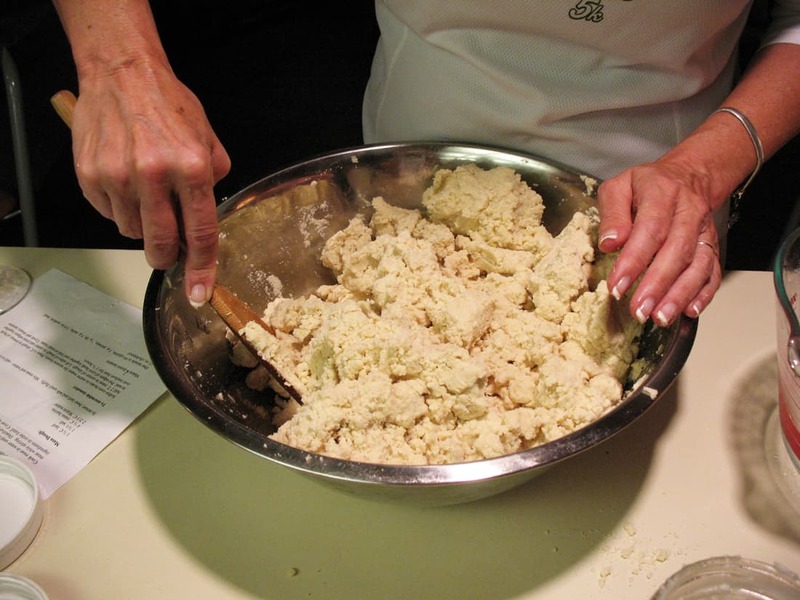 This recipe makes approximately two dozen tamales (depending on the size you make them). Two dozen tasty tamales. I’m just saying; if you like tamales and go to all the work of making your own, make more than a single batch! You’ll thank me for this advice later. Veggies for the filling of our vegetarian tamales. 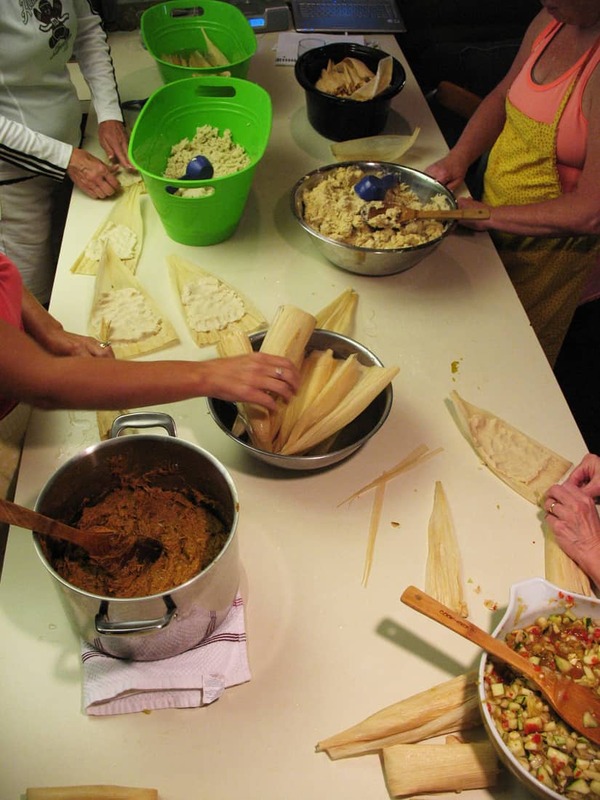 Grab some friends, take a day (or two) and make yourself some tamales. Then sit yourself down to a big feast to sample your hard work. There’s nothing like homemade food shared with people you like to hang with. Mmmmm. 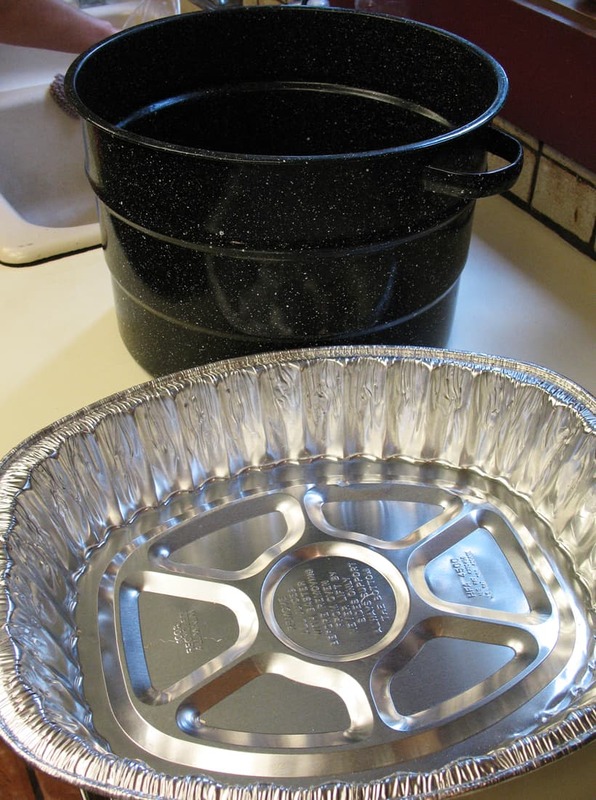 **If you don’t have a large steamer (I don’t), you can do what I do: I make one using a disposable aluminum turkey roasting pans and my canner (keeping the rack in the bottom). I take the roasting pan, put it inside my canner, and bend it to fit (as best as I can—it’s never perfect). I then stab several holes in the bottom of the roasting pan and fill up the bottom of the canner with water. Because the rack is still inside, the roasting pan sits on top and the water is below, and it creates a great large steamer for practically free. Sorry, we were so intent on eating the finished product, I forgot to take pictures of them cooked and ready to eat…guess you’ll have to make some of your own to find out what they might look like. 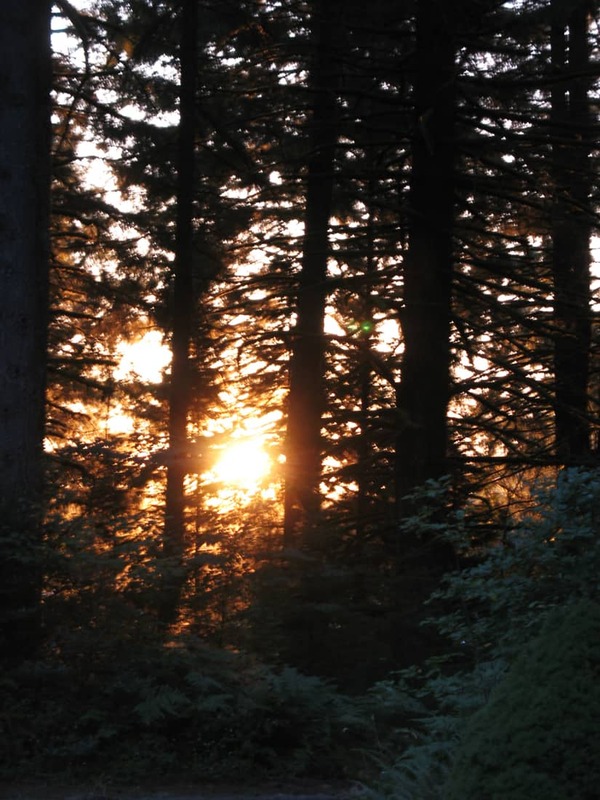 After a big day of cooking, and a big meal, we ended the day with a woodsie walk in the gloaming. Life is good. And tamales with friends make it even better.